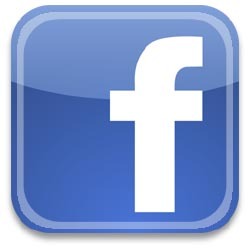 Game fishing is fun and not just for seasoned anglers. With a bit of practice anyone can catch fish and enjoy this magnificent sport. 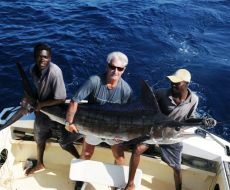 Kenya offers some of the finest deep sea fishing in the world with a huge variety of different species. 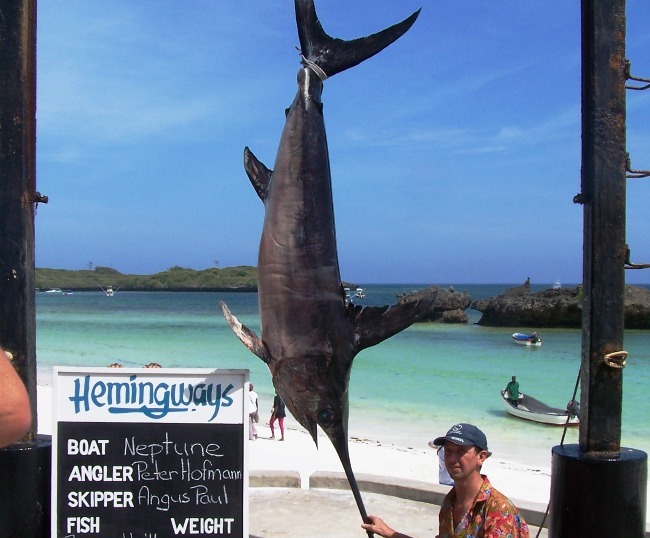 There are a number of hotels and companies in Watamu that provide game fishing. Responsible companies support the practice of â€˜Tag and Releaseâ€™ of Billfish and award certificates to anglers who have done so. 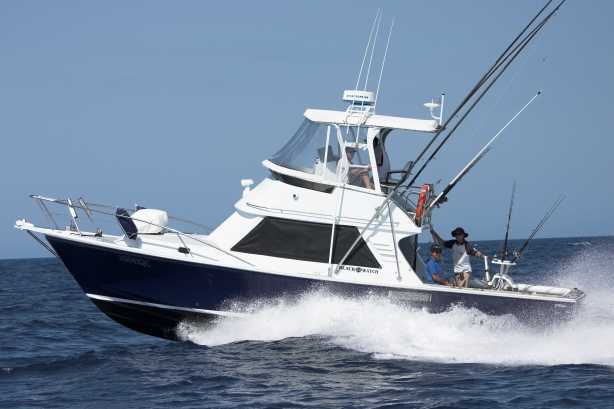 The main Billfish (Sailfish and Marlin) season runs from November to early April but Sailfish and Black Marlin often come inshore in numbers in August. Sailfish (known locally as â€˜suli suliâ€™) are by far the most numerous of the Billfish we have here. The Marlin: We have three types here - Striped, Blue and Black. 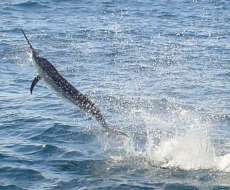 Striped Marlin tend to run offshore in cleaner water and can travel in packs. Smaller and slimmer than the other two, this fish will still give a good account of itself. 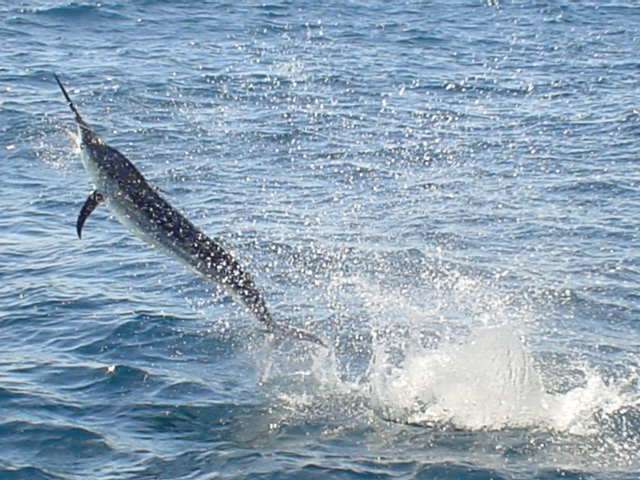 A jumping Blue Marlin is the ultimate thrill as the power and fury of these fish under full throttle is simply awesome. A big Blue Marlin is a privilege to see and they are found usually in the deep water following the yellowfin or other tuna shoals. 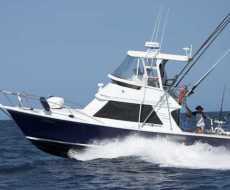 Some very big Blue Marlin can be expected mid February to mid March. 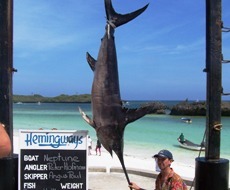 Black Marlin come closer to shore and are often encountered in very shallow water. The buffalo of the species, this guy is tough. Medium size Blacks can be expected around August/September, but the main season is from December to mid/late March. Broadbill Swordfish -. This is definitely the strongest fighter in the ocean - an experience not to be missed. So far mainly small, but several in a night not uncommon. Sharks - we have three species of Caraharinus here- Hammerheads, Tigers and the high leaping Mako. 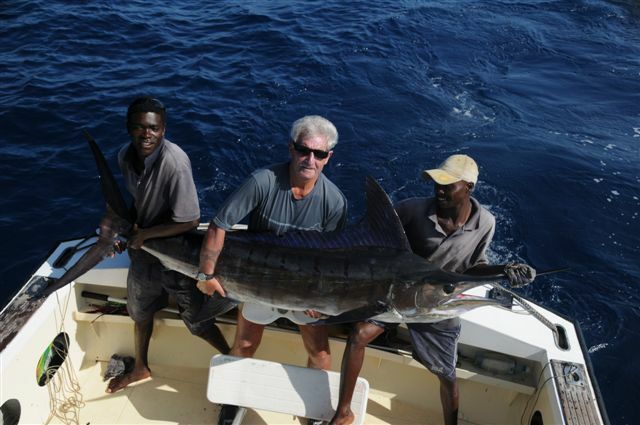 These are often caught while fishing for tuna, they also take Marlin baits. We don't drift with chum or â€˜rubby-dubbyâ€™ here - it doesnâ€™t work due to the current. Big Yellowfin tuna (up to 200 lbs.) migrate past here between August and November (and sometimes come back again) and the â€˜schoolieâ€™ small Yellowfin are around virtually year round. Very strong fish and, with a big one being a good test of character, Yellowfin always give a powerful performance, invariably going deep. Giant trevally (locally known as Karambesi) of World record size are here but have yet to be boated under the very strict IFGA regulation. Usually caught on live bait using down riggers. Wahoo are renowned for their searing first run (being one of the fastest fish in the sea) and when there are a lot of them around, chaos reigns as lines are cut all over the place by fish striking at terminal tackle moving through the water. Kingfish will often chop up a bait or two just behind the hook before you get one but make up for it by being excellent table fare. Dorado (known here as Falusi) come streaking across to your lures, iridescent with all the colours of the rainbow as they take to the air when feeling the hook. Fabulous light tackle fish and great eating (but rich) when prepared on the day of catch. Skipjack, Kawakawa and others of tuna descent swim in shoals surrounding and forcing small baitfish to the surface, making it boil and giving their position away.